Does anyone have an elegant solution for a steep driveway? I've been getting by with wood I picked up from Lowe's but was hoping for something that is more long term like a heavy duty rubber ramp. I actually bought that and doesn't work for my curb. I don't need a curb ramp as my driveway is already like a ramp. The issue is that the incline on the driveway is too steep. Good luck with your search. I have been using a similar hacked together wood/rubber combination. If someone has some good ideas, I'd be interested too. I've searched around online quite a bit and haven't found much. Let me know if you are thinking about selling the ramp you already purchased that doesn't work for you as I have been planning on trying it out. I used 3/8 in sheet iron with holes in it and some supports. Then painted it and striped it yellow/black with safety/non slip tape. Gets past the city, allows water to flow under it, and 'just' works. I have a high crowned rode and steep driveway. I wish I had one as gentle as in the pic above. My ramp is nearly 3.5ft wide. But., build it right it still looks good and can pass local safety stuff if that exists where you live....oh wait, you live in the same place lol. When I get my car fixed I can show you what I built. oh, and I just saw your username, and yes (separate subject), I should be tackling the engine next weekend if about. I will have clam off and basically we will step through the entire supercharger install process (backwards, then forwards!). [for other readers] Sorry for the rambling! If you do not have the SirLotus clam protectors, I would recommend them. I want to have mine shaved down, but no one will do it. They all want to pull up what's there and start fresh. I don't understand. Did you guys know that Porsche and Subaru make some really nice sports cars. I would have considered that if I had that driveway! Forget the Porsches and Subarus...what you need is a new house! Had the same problem with our driveway when we first moved in. 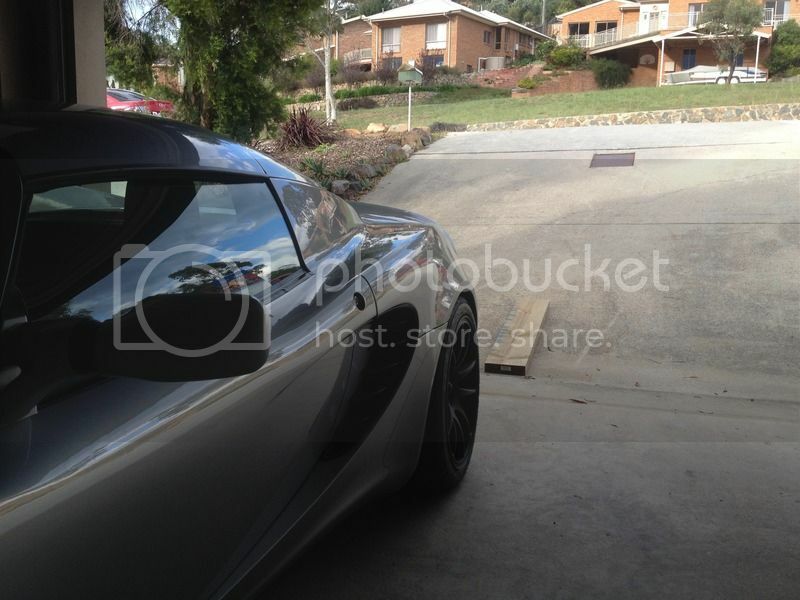 The Elise wouldn't get into the garage. The solution was to build another garage. Try raceramps.com. They will custom make ramps that fit your needs and are a bit less than redesigning your driveway. Hard to tell from that angle, but from what I can see the curb 'ramp' I had was every bit as severe as the one in your pic. With my Elise and Exige, I was able to clear the curb without ramp or other device by approaching in nearly parallel, with one wheel (almost always driver's front) going up the curb first, passenger side would start going up the curb after the driver wheel cleared it. We excavated 100 truck loads of dirt prior to building the house to change the grade so that the driveway would be nearly flat. Everything gets planned around the Lotus. This. I thought the same when viewing the picture. Give this a try and let us know how it went. I did the same in a previous house... well, minus 100 truck loads of dirt. Everyone else in my neighborhood had steep ramp driveways, after a lot of work mine was not as steep then it was made flat before entering the garage. 1) So car could make it up driveway, and 2) so that I could work on car outside garage on stands (flat).